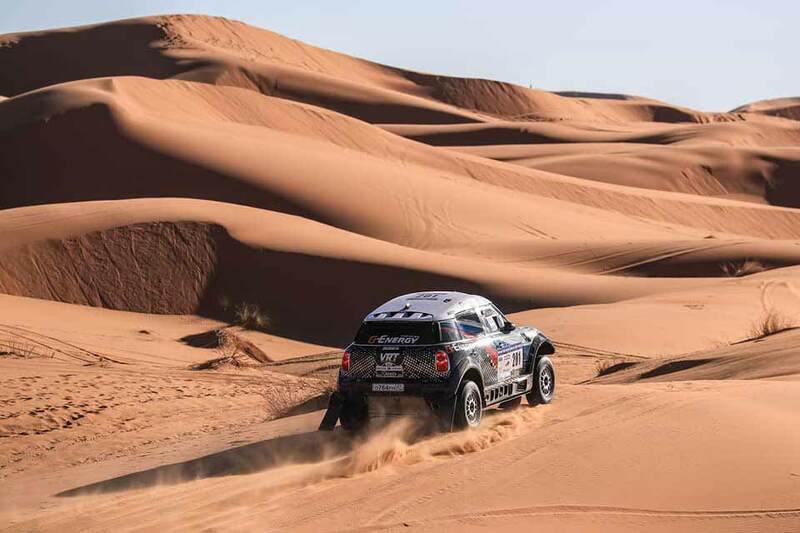 The Russian duo Vladimir Vasiliev and Konstantin Zhiltsov continues to hold the lead in the Africa Eco Race with their G-Energy X-raid Mini after the second stage. The Dakar-experienced team and former Africa Eco Race winners especially liked the dunes of the Erg Chebi: This famous area of the Moroccan dunes is normally not very complicated - if the sand is not too soft and you are driving in the right direction. The Russians again won the stage in 04:50:25 hours, only 1:56 minutes in front of the French Mathieu Serradori and Fabian Lurquin (LCR30 Buggy) and 14:26 mins to Pascal Thomasse and Pascal Larroque (FRA, MD Optimus Buggy), fourth became the Russians Andrey Rudskoy and Yevgeny Zagorodniuk in their G-Force Prototype (+39:43). "There were two motorbikers ahead of us, and for a while we rode along their tracks - and lost time, when they climbed to the tops of the dunes, following the rigid course, so we opened a new track," Vasilyev said after the stage. "This was a great stage with all the sand, dunes and a lot of jumps, especially for the Buggies. In the mountains we could play with them but in the sand they showed all their advantageous possibilities. The last 50 kilometers were like a highway." Navigator Konstantin Zhiltsov reported: "For us, the dunes were a special lesson. It was not easy - to be the first car on the road is difficult. Especially on Wednesday. We know this area, but usually the stage here is made in the different direction. So we had to fight with sharp dune ridges, jumping downwards two to three meters - and this all in very dry and soft sand."